NOTE: Smartphone and Battery are NOT included. It is perfect for selfie taking and filming; The light settings are plentiful. 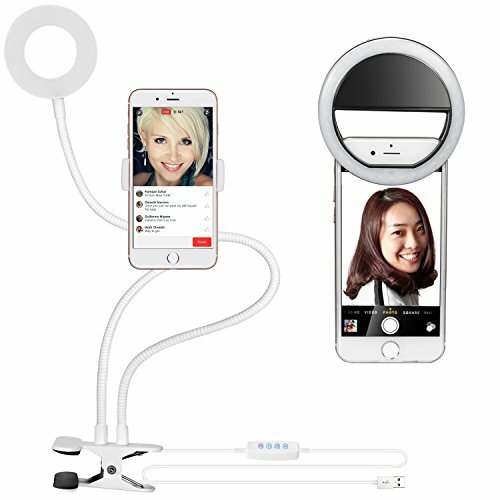 8-Level Brightness to choice, easy adjust brightness based on the back light, help to improve the quality of selfie, video chat. The clamp is very strong and is padded so it won't leave marks or imprints on what you clamp it on. Adopt USB port, work with multiple devices. You will be able to enjoy both the lamp and the cell phone holder at any time freely. Its large clip base for Stable Mounting without Vibrations, tight and bendy arm, secures your smartphone and other electronic devices tightly to prevent the unit from falling or moving around. Compatible with iPhone X/8/7 Plus/7/6 Plus/6s/6/5s/5/4s/4/Samsung Galaxy S6 Edge/S6/S5/S4/S3, Galaxy Note 5/4/3/2, Blackberry Bold Touch, Sony Xperia, Motorola Droid and Other Smart Phones. With 3 different levels of brightness, you'll find the perfect lighting needed for your photos. It serves as a great emergency light for dark circumstances, or could be a fun side supplemental light for creative photography or video. Does not heat up after continuous use and this can also be used as an emergency light.